Book Description: The Adaptation Guide is a practical reference about how to customize — or adapt — an open textbook so that it better fits your needs in the classroom and elsewhere. This guide defines the term adaptation and discusses reasons for revising a book, why this is possible with an open textbook, and the challenges involved. The Adaptation Guide is a practical reference about how to customize — or adapt — an open textbook so that it better fits your needs in the classroom and elsewhere. This guide defines the term adaptation and discusses reasons for revising a book, why this is possible with an open textbook, and the challenges involved. Adaptation Guide by Lauri M. Aesoph is licensed under a Creative Commons Attribution 4.0 International License, except where otherwise noted. This guide is a remix of original material, text from the BCcampus Open Education Authoring Guide by Amanda Coolidge and Lauri Aesoph, and text from 6 Steps to Adapting an Open Textbook by Clint Lalonde. 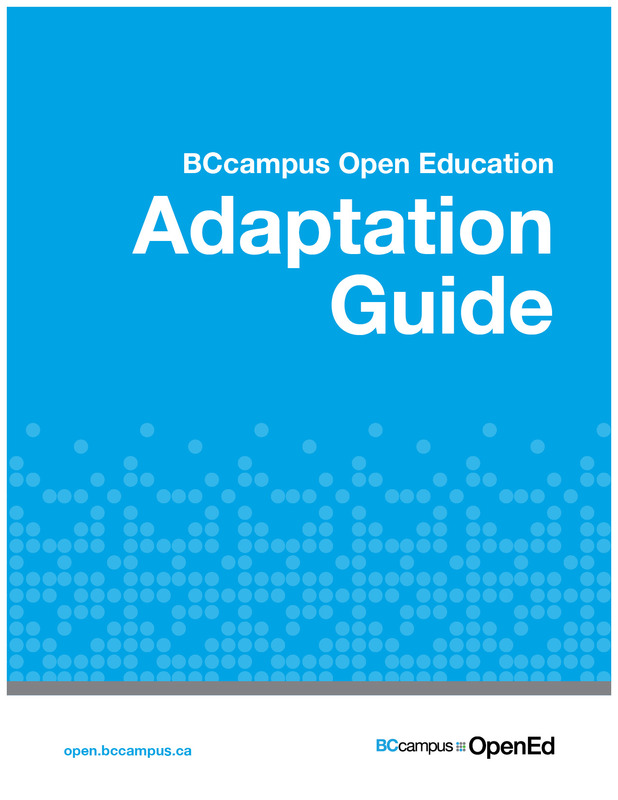 The BCcampus Open Education Adaptation Guide by Lauri M. Aesoph is used under a CC BY 4.0 International Licence.